Prime rib is a special occasion-worthy cut of beef that's perfectly suited for Christmas feasts, New Year's Eve dinners, or really any time you want to serve a truly celebratory meal. With the main course in the oven, there's only one more thing to do: select side dishes that pair with the succulent, rich, meaty flavor of prime rib. Making a ham dinner this year? There are lots of tasty options, too. Yorkshire pudding is a traditional part of British prime rib dinner. You can think of it as something between a popover and a souffle, with beef drippings used to coat the muffin tin for extra meaty richness. 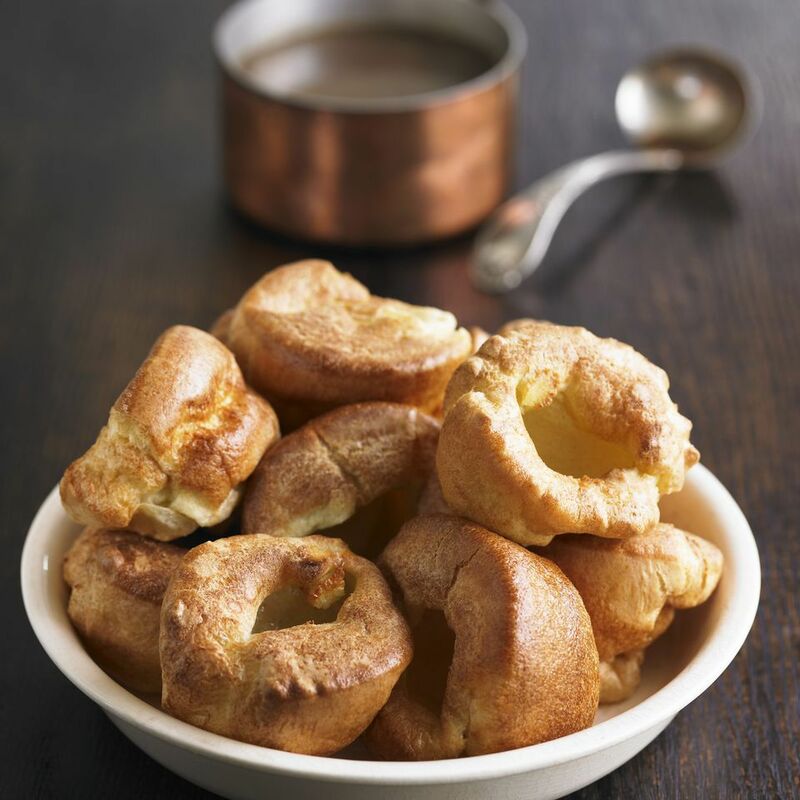 Gordon Ramsay's Yorkshire pudding recipe produces beautifully puffed, golden brown and crispy Yorkshire puddings. Truffle French fries scented with aromatic truffle oil are a decadent way to enjoy potatoes with your beef. Use a good quality oil and waxy yellow potatoes to get the crispiest, most addictive batons. This crumble-topped butternut squash and apple casserole is a holiday crowd-pleaser. Sliced winter squash and apples are spiced with cinnamon and nutmeg, then baked with a crunchy, buttery topping for the perfect finishing touch. Creamed spinach is a rich and delicious side dish that pairs very well with roasted beef. This velvety version is luxuriously creamy and only calls for five ingredients, with Parmesan cheese giving the greens big flavor. There's definitely something special about these bacon roasted Brussels sprouts to make it a party side. This recipe needs only three ingredients—plus a bit of salt—and delivers great taste. Potato pancakes are a classic accompaniment to prime rib. Serve these parsley- and onion-studded potato rounds with applesauce or sour cream on the side. Risotto upgrades everything you serve it with. This recipe calls for earthy porcini mushrooms cooked in rice with a decadently creamy sauce made of butter, garlic, shallots, wine, cream, and Parmesan cheese for this lovely porcini mushroom risotto. Take your prime rib dinner to the next level with a restaurant-quality horseradish sauce. Serve it at room temperature in a gravy dish, or a pretty bowl with a silver spoon for a fancier presentation. A savory spinach souffle is sure to impress. This outstanding recipe creates a light, airy, and delicious side dish that you'll be proud to serve during the holidays or any special dinner. Sometimes simple is the way to go. Creamed peas with mushrooms and onions are comforting for everyday dinners, but still feel dressed up enough to serve with prime rib. The creamy sauce that cover the steamed peas and mushrooms will have everyone reaching for some crusty bread. This traditional make-ahead Duchess mashed potatoes dish is one of the prettiest ways to serve potatoes. Mashed spuds are piped onto a baking sheet and baked to create elegant little browned bites. Bonus: It's a wonderful dish to make ahead and freeze for easy reheating. This savory spinach and mushroom strudel looks beautiful when cut into slices and served alongside prime rib on the plate. Mushrooms, spinach, onions and tofu combine to create a rich, yet healthy filling. Use store-bought puff pastry to cut down on the prep time. It's also lovely as an entree for vegetarian guests. Put a ring on it! These maple glazed squash hoops are glazed lightly, then roasted to form a delicious vegetarian side that everyone will ask for seconds of. This French potato gratin Dauphinoise recipe uses the traditional French cooking method of baking potatoes in milk, cream, and cheese to create a heavenly side dish that smells out of this world. The best part? It tastes even better when made ahead and reheated. Fresh or frozen green beans can be used to make this simple yet tasty sesame green beans side dish that is gently flavored with teriyaki, olive oil, and garlic, then tossed with sesame seeds. You can toast the sesame seeds before adding to add color and bring out their naturally nutty flavor. Just a few simple ingredients—potatoes, fresh herbs, garlic, and good quality olive oil—are needed to make this rosemary roasted baby potatoes—a truly comforting side. For a more colorful dish, use half baby red and half baby Yukon gold potatoes. You can also toss in your favorite fresh herbs or add bacon bits with the potatoes before roasting. James Beard Award-winning food writer created this Nigel Slater's fried cauliflower recipe to elevate the humble vegetable and turn it into a holiday-worthy dish. Cauliflower is fried, spiced up with paprika, and served with a tasty salsa verde made with plenty of fresh herbs, mustard, garlic, capers, olive oil, and lemon juice.